Sondheim, Gershwin & Porter- Oh, My! Home/Sondheim, Gershwin & Porter- Oh, My! This summer, join members of the CFCArts Community Choir as they present the memorable works of some of America’s greatest composers. 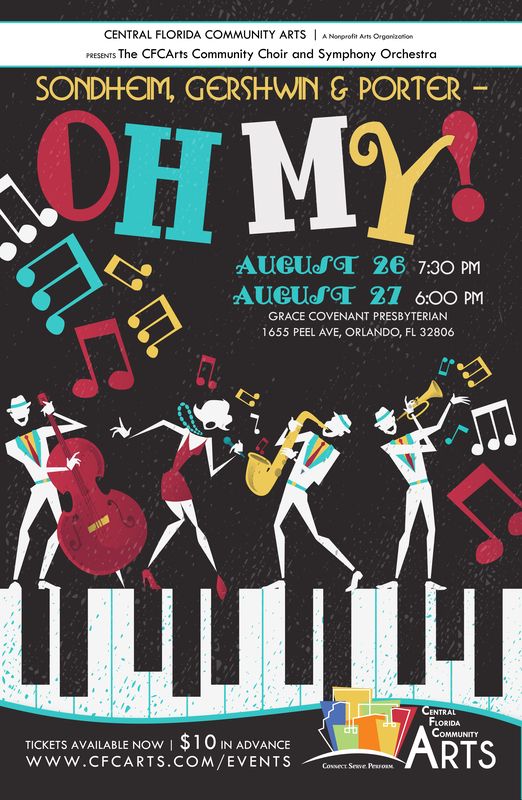 Enjoy songs like “Someone to Watch Over Me” and Summertime by George Gershwin, known for his popular stage and screen compositions. Relive the beauty of the classic Night and Day by Cole Porter, gifted writer and lyricist of Broadway shows such as Anything Goes and Kiss Me Kate. Finally, take in the lyrical and melodic complexities of Stephen Sondheim, known world over for his contributions such as West Side Story, Into the Woods and Sweeney Todd. This concert will leave you tapping your toes, snapping your fingers and humming these familiar tunes for days to come. Sondheim, Gershwin, & Porter- Oh, My! will be held on Friday, August 26th at 7:30pm and Saturday, August 27th at 6:00pm at Grace Covenant Church 1655 Peel Ave, Orlando, FL 32806. Advanced purchase general admission tickets are $10.00. Children age 12 and under will be admitted for free.